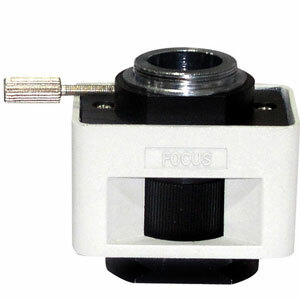 This C-Mount adapter allows the use of a variety of C-Mount compatible cameras to be mounted on the vertical port of our GS series trinocular microscopes. Includes a built-in 0.5X relay lens (the best for most cameras). Can be focused so the camera's image and eyepieces are both in focus. For higher magnification see our 1.0X C-Mount.